Now you’re making him mad! First, a new Shingworks tutorial about worldbuilding went up for $5 Patrons yesterday! The supplement worksheet goes up tonight for the advanced tiers~ Additionally, the behind-the-scenes art/ comments for this page are up now, with a labelled breakdown of the layers I use for coloring pages like these. I’m also at a point where I’m equally invested in the storylines of both comics; Patrons of any level can vote here if they have an opinion on whether the 3rd update this week should be a Meek page or a Mare page. Last, I’d missed these initially but there was a nice little review by Dragonhide late last year, followed by a mention on the ConSequential podcast at the 17mins point.. honestly I put my head down on my desk and laughed (if you don’t care to listen, it’s basically the reviewer hesitatingly trying to explain the plot comic without spoiling anything, and settling on”it gets really weird”). I really appreciate anyone who shares this comic with their pals, especially given the weirdness of the plot. Test what the real LEVi should AND shouldn’t know. Still wouldn’t prove this isn’t some elaborate mental simulation or that she isn’t hallucinating. Hmmm. Seems complicated but it could be as easy as two objects, alike except in colour, pulled without looking from a container and then shown from each hand to Levi but not Bex, followed by asking him which hand has which colour. I love LEVi too much. I’m exactly the same! I call it my “tiny dyslexia”. It is so bad that at some point during my childhood, I subconsciously came up with the crutch to call my hands “left” and “right” correspondingly and whenever I need to quickly know where is left and right, a glance at my hands will tell me what’s what. Unfortunately, that made extra challenging to learn to drive. The instructor couldn’t understand why whenever he told me to turn left or right I couldn’t do it without taking my eyes off the road. lol, I feel this so much. I can’t follow spoken navigation… when I go places I have to memorize a map so I have an aerial view of it in mind before driving, because verbal directions lag at least 10 seconds for some reason? Making an “L” with my left hand used to help, but in the moment of “turn left here” I forget what L looks like. I wonder why that is… part of me wants to tattoo “Right” on the back of my right hand so I never have this problem again. OH wow. I also have this problem, almost exactly the same way you described it! and thinking about a dominant hand doesn’t help me either, because I write with my right hand but do a lot of other things (eat, brush teeth etc) with my left hand. I totally get what you mean. I actually find directions like “Go west” easier since I have a lot of landmarks to utilize for orientation. That’s why I’m extremely aggressive towards having a good helmsman if I’m driving to places unknown. My ex girlfriend had that problem. I learned not to trust the turns when she gave me written directions to a place. I know at least one other person with this kind of problem too, and she’s also an artist, huh. BTW, the tattoo can say “That’s right!” it will be a good pun and useful in social situations. Try using tape to write the words ‘left’ and ‘right’ on the windscreen. Then you can still be looking at the road while you check which direction to go. Good luck with it. I had the idea because when I was learning to drive, my instructor put a bean bag near the centre of where the dashboard meets the windscreen. He told me to use that as a guide for how far the car should be from the curb. If the bean bag was in front of the curb, the car was in the correct position. So I thought of a similar visual aid for you. A friend of mine and I used to say “blinker bar up” and “blinker bar down”. The the little arrow will light up and tell you which way to go, but you don’t even need that because the direction your hand is moving when you push on the blinker is the same direction your steering wheel needs to go. When your hands are on the steering wheel, point index finger on your left hand up and loosen your thumb. It will make an L. At some point you don’t have to glance anymore, you can just point and remember. That’s how it worked for me, anyway. I just realised the left/right problem probably feels the same as horizontal/vertical does to me. Fortunately, there are no flying cars yet. I have the same problem. Left and right, east-west-north-south, etc. I call it “navigationally impaired”. ITT: People who are slightly impaired find out that they are not alone in the world! Which reminds me of a story from a merchant ship. I know someone that, when practising for their driving license, they would always drive left when the teacher said right, and vice versa. The teacher was close to tears, until he found out she was a dentists helper. A dentists helper always has to switch the directions in their head if a dentist says “remove the saliva from the right of the mouth” or “move the mirror left”, because they will likely be saying it from their perspective. This habit stuck, so when you say right to her, she will first think of what we would consider left. Also, I am always surprised that if I tell someone they have something stuck to their cheek, or similar, and indicate the spot on my own face, they will react like they were looking in a mirror – when I touch my right cheek, they would touch their left cheek. It doesn’t make sense to me, after all I am not a mirror. I lowkey have this problem, as well. Great sense of direction, but when I’m writing stories it’s things like a character will grab something with their right hand and then next thing ya know, it’s suddenly in their left with no mention of having switched. Haha, yeah that’s my bad for not checking accurately. It’s supposed to be assessing if Thrip responds to verbal commands/ that she’s not hallucinating their ability to communicate. It could also simply be the difference between his right and her right. She never specified which she meant. I love it, two intelligent characters asking questions normal people would ask and reacting as expected. It’s really refreshing given how little Mike cared :) at first anyways. It’s funny how even though Mike is out of the picture, his character is still being expanded on a little bit. Also, it’s not crab: it’s Thrip, mind you. “What are the names of the two scientists worked with at Devotion?” Should there be a “you” in there somewhere? Was that snark, or just not knowing how literally to take her and playing it safe? Could be either or both and therein lies the beauty. I think Levi picked up some of Mike’s behaviors, after months of being exposed to his personality. Sarcasm is known to thrive in almost any environment. It’s like a psychological tardigrade. Progress, rational behavior! Yeah! I can’t tell you how relieved I am for both of them. She’d even eat mike if she had the chance. She just loves eating sentient passive lifeforms. I bet she used to eat COW on earth. I like how thrip/levi doesn’t talk in a exactly robotic way, stuttering and talking casually as a ‘human’ would, I donno if that’s part of the AI or if it’s a result of them having a flesh brain instead of a robotic ‘brain’ but it’s a fun little touch. Don’t care if it’s a coincidence, but panel 4 is a reference to Terminator 2: Judgement Day, when John asks T-800 to stand on one leg. I know that LEVI was an AI, but I wonder if part of it’s current personality is due to it’s organic state? i wanna know what that fancy net is made of. Finally, I discover what LEVi stands for! For all you people that posted about left and right giving you problems, I have to wonder if it’s because your brain is better at spatial perception and *it* knows that these “left” and “right” designations are arbitrary. Spin around 180 degrees and what was left is now right. It’s a theory, anyway. That’s my theory too, left and right seem so arbitrary from my bilaterally symmetrical perspective, haha XD I bet if I chopped off a fingertip on one hand or something it would make it a lot easier to remember. Well… I do have excellent 3-dimensional mapping skills, I just lose which is r/l, n/s/e/w/, etc. Can Bex understand Thrip because she’s… an ENTOMOLOGIST?? I love this comic but I sure have read more weird than this lol. I’d call this more sci-fi mars exploration? If I had my way I’d love an update to this one before the meek. I read both but this one so far is my favorite. Funny because I found the meek first then it wasn’t updated for so Long I put it in my hiatus folder but was happy to see it back again. I do really love this one and I love your art. I’m an artist also. I was an fine artist and an illustrator, then went on to get design degree and ended up doing magazine design for 10 years and very little besides a book or magazine illustration here and there. Couldn’t take it anymore so am back at my art but sculpting full time now lol. If I’d been younger I might have tried this because I love comics! Anyways keep up the great work. 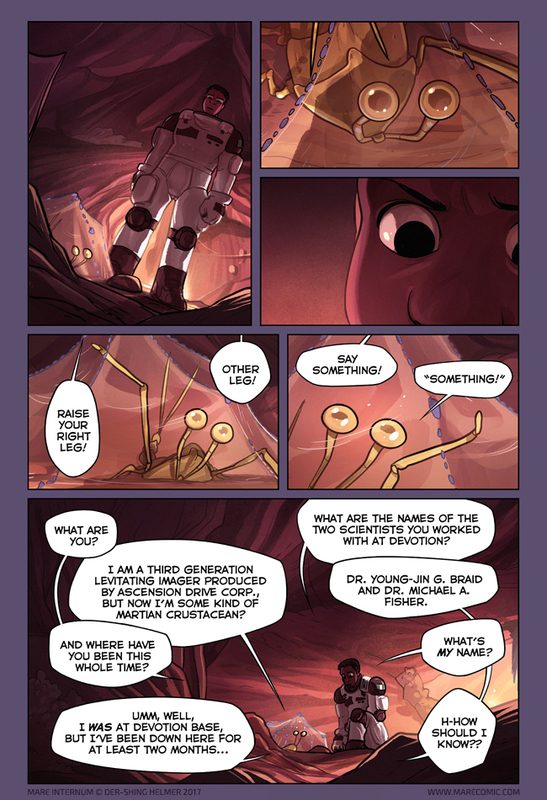 This comic is so good, this page is perfect. I’m impressed every time. Panel#2 has the most adorable look I’ve ever seen on anything. I was not aware crustaceans were allowed to look this cute! OH MY GOD yes lol :-D FRigging best thing ever, hahaha!! Hey, hey what do you call a red-haired baker? Aw – thanks. Glad the podcast made you laugh. It was super hard explaining this without giving too much away, and I’m not sure I did a great job. Loving the comic though. I’ve been recommending it to whoever will listen. That’s a day of my life I won’t be getting back and if I did, I’d spend it sat at my laptop reading this all over again! I’m loving your work; the themes you explore and the way you explore them in such a believable and honest way (despite MI quite literally being on another planet, in the future, with Thighfriend, Threvi and… Kalla…) All done so carefully and so well thought out. I did not expect a webcomic to resonate quite so much. So, thank you! Gahhh.. I haven’t even mentioned how beautiful some of the art is but I’m gonna stop myself before I write a real text wall here.